Here you will find everything you need to get started coding for bitcoin/altcoin - PHP, JSON, ASP, Python, Java, C#, Node.js, etc. Simple instructions on how to integrate GoUrl Payment Gateway to your scripts/website (ASP, Python, Java, C#, Node.js, etc). If you use PHP language, please goto here, for other languages - read below. Also see full presentation how gateway works ( from buyer and seller sides ). You can directly specify your price in USD (float values allowed) and cryptobox will automatically convert that USD amount to cryptocoin amount using today live cryptocurrency exchange rates (updated every 30min). For example, if you select BITCOIN currency and amountUSD = 14.6 USD - we will convert it to bitcoins and it will be 0.063 BTC. We will display it in crypto payment box for payment by the user. User will pay you all times the actual price which is linked on current exchange price in USD on the datetime of purchase. Also you can use Poloniex.com, Bitstamp.net, etc autosell feature and auto trade your cryptocoins to USD/BTC after payment received. Using that functionality (price in USD), you don't need to worry if cryptocurrency prices go down or go up. 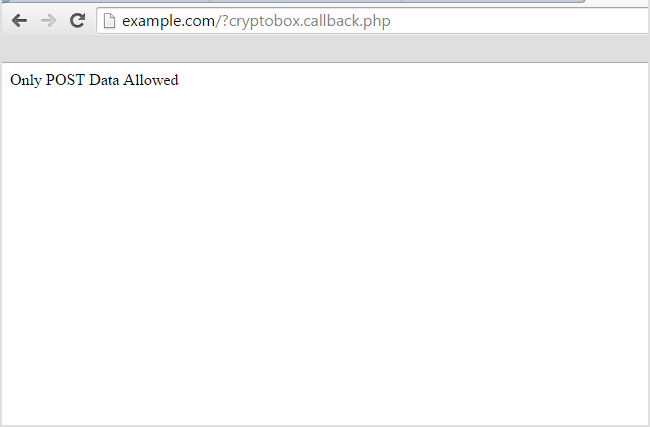 You can use in cryptobox options one variable only: amount or amountUSD. You cannot place values of those two variables together. Please use value 'MANUAL' all time. Other values available for PHP websites only. Please use empty value '' all time. Other values available for PHP websites only. Optional, your gourl affiliate key or leave empty value. Security md5 all values hash. You should generate it on your server and place value in script; it protects payment box iframe parameters / json output from changes by end user in web browser. HASH value generate as - php code. 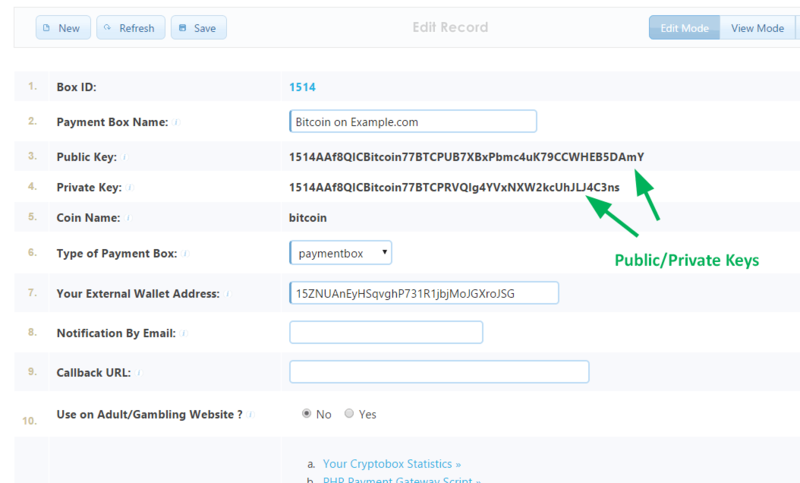 Notes: if you use the same public_key, orderID and userID in your multiple cryptocoin payment boxes on different your website pages and a user has made payment; a successful result for that user will be returned on all those pages (of course if period time not expired). 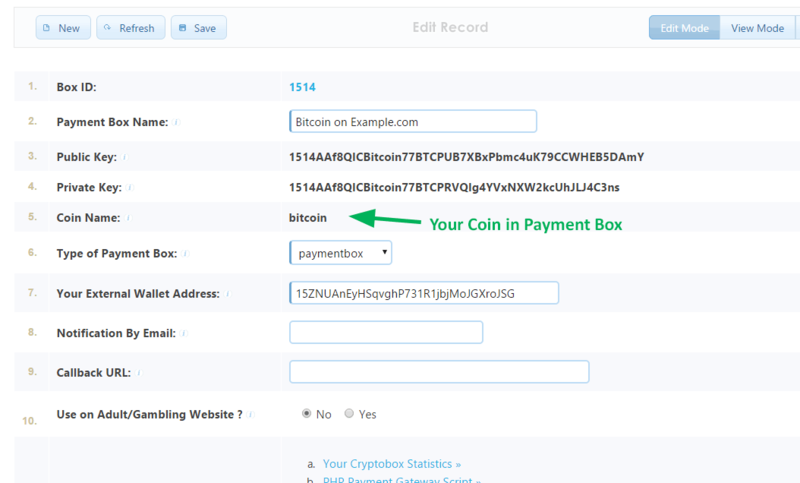 When a user has made a payment, our server will send payment data using HTTP POST method on your callback url specified in field Callback URL of your crypto payment box. 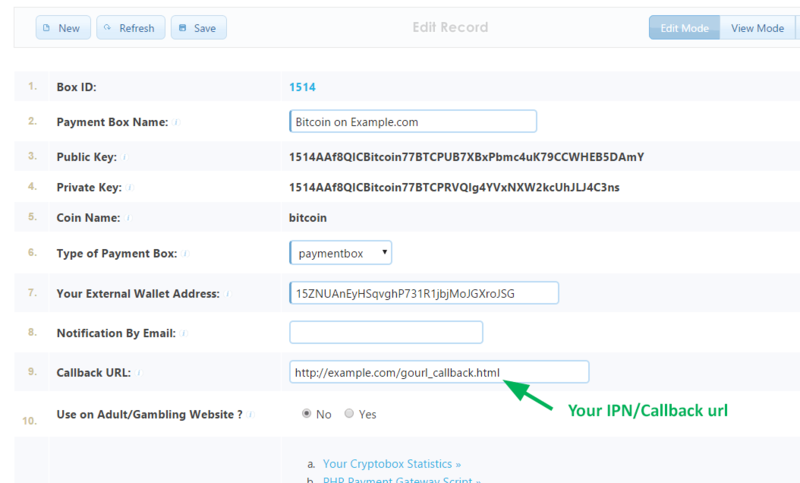 As backup (if your IPN url not configured/not response), user see on bottom of payment box button 'Click Here if you have already sent coins' and when he will click on that button, script will connect to our Gourl Gateway Server and check user payment status (receive copy of IPN data). Your script, should check whether the payment box private key hash recieved in POST["private_key_hash"] is correct, POST["private_key_hash"] = hash("sha512", your_gourl_private_key). It will guarantee that payment data are valid and sent from our server. You should publish result text on your callback webpage. 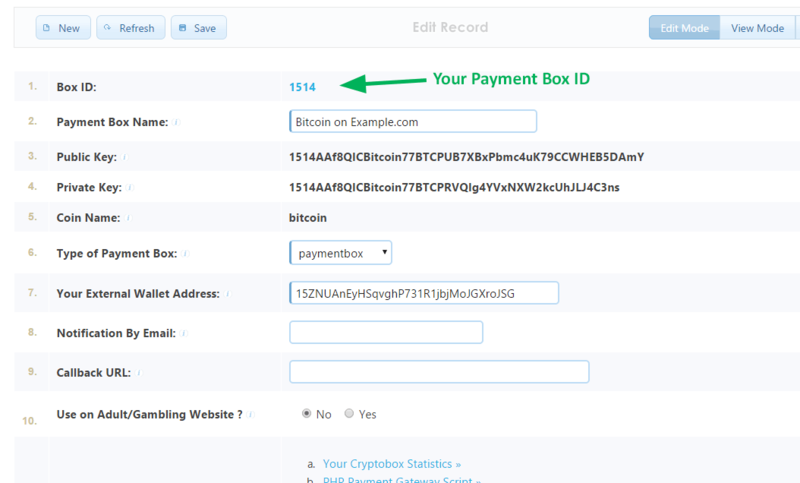 Allow text - "Only POST Data Allowed", "cryptobox_newrecord", "cryptobox_updated", "cryptobox_nochanges"; it use for synchronise data store on our server with data on your website. No other text output on callback webpage! Example below. a) when a new payment is received and unconfirmed yet, values: POST[confirmed] = 0, etc. b) and a second time when existing payment is confirmed (6+ confirmations) with values: POST[confirmed] = 1, etc. All other values are the same. But sometimes if the payment notification is delayed for 20-30min (for example, your site was unavailable and GoUrl Gateway auto re-send data later), the payment/transaction will already be confirmed and the function will appear once with values: POST[confirmed] = 1, etc. We offer Free Support in the integration of our GoUrl Crypto Payment Gateway in your scripts/plugins/website.